… because this was the suckiest game ever. 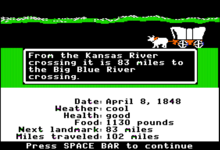 I trace my lifelong disinterest in video games to The Oregon Trail, the “original” educational computer game. 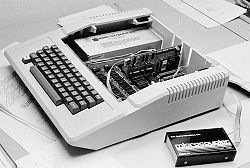 So the fact that we actually had a computer in 1978 is beyond comprehension looking back. The parish priest was a penny-pinching curmudgeon who absolutely would have been okay with burqa’s. The man loathed females. I imagine when the computer arrived, it was only with the provision that girls be kept off of it as I can’t remember any of my friends or I ever getting to do much more than watch the boys play Oregon Trail. It was an Apple II. To give you some perspective on technology in schools, when I was student teaching in 1986, the junior high I was at had a computer lab full of these same computers. The first middle school I was assigned to in 1988 was stocked with Apple IIe’s. Progress at the speed of walking. The Oregon Trail was a way for our social studies teacher to lighten his load. As the computer was located in a small room off the main office, he would send us there in groups of 6. If that seems too big and a really stupid thing to do – it was. Six teenagers in a small, unsupervised room was a grave tactical error. ** But with in excess of 30 students per class, I can’t fault the guy for his desperation though his method of divide and conquer did little more than irritate the school secretary. Playing Oregon Trail was boring enough but as a group activity, it totally bit. I usually brought a novel along and read as the others tried to navigate an obstacle course of dysentery, venomous snakes and unfordable rivers. Bullets were key. Caulk was crucial. And tombstones abounded. Apparently one can still purchase this game on Amazon … for six dollars. Sounds about right. *I did nothing for two years. The school was a zone. Why none of our teachers just cracked and showed up with a shotgun one day, I don’t know. We often thought the Social Studies teacher was capable of a break with reality as he was often reminding us of his tour in ‘Nam. If it weren’t for the fact that I wrote or read near constantly to keep boredom at bay, I’d be a shift supervisor at a fast food joint today. **I was often guided in my own teaching career by memories of the idiotic things my junior high teachers did. I resigned from my teaching position of twenty years in the spring of 2007. At the time, I had vague notions of rolling over my teaching certificate and working as a classroom teacher in Alberta. I still think about the license – need to get on that really – but the idea of teaching high school again doesn’t warm my insides. So I semi-officially retired from teaching. I still read about the horror known as “reform” down in the states and I write about it (none too flatteringly which would make it hard to secure a teaching position down there again, methinks), but I don’t harbor any notions of returning. When I left the building, I didn’t look back. Okay, I still love office supplies, but that aside, I don’t miss the job of it. And it was a job. A thankless and mostly mind-numbing job as the years ground on. I blogged. I wife’d the house, mothered the child and poured myself into myself and my husband. And life was very good. But somewhere along the line, yoga arrived and then the urge to teach it followed, and now I am not exactly retired anymore. In fact, I am working – more and more. What started with filling in at the studio here and there became an employment opportunity when I was offered one then two and now three classes of my own. Quickly on the heels of this came an offer to teach two nights a week at the community hall across the street. Add to this the fact that I’d already agreed to take every third Friday teaching a class for figure skaters in the next town over. Between this and the Care2 gig – I am working again. Not that I could pay the mortgage – which isn’t an issue because we don’t have one anyway – but it’s an exchange of skills for money. I haven’t done this in a while and it’s … interesting. I had to shop. My yoga attire is not exactly Lululemon. I gave her up a while ago because the pants are too low-cut and the fabric doesn’t breathe enough for my comfort level. I am a capri’s and leggings type with long t’s and sweaters. Layers is the middle-aged woman’s best friend. I have a lesson book. I write out sequence plans. It’s like the old days only everyone who shows up wants to be there and pays attention. Not that many are showing up. It’s not my studio. People who come expect Jade. And why not? She’s good. So my classes have a couple of folks here and there. It’s a bit disappointing in the first few minutes but once I start to teach, I lose myself in the instruction and forget about the numbers. The community hall class will be bigger. Nine registered officially and a few more who’ve verbally committed. Perhaps I can lure a few into the studio? It’s a goal; I won’t deny it. Someday I will have a studio. Somewhere. I don’t think it will be soon or here, but the future – as Yoda pointed out to Luke – is a difficult thing to pin down for prediction purposes. For now, I am a working girl again. That’s all I need to know.